With just 4 ingredients these Healthy Peanut Butter Balls are perfect for your chocolate peanut butter craving! Mix together the chopped peanuts, peanut butter, and sweetener. Divide the dough into 18 pieces and shape into balls. Place on a wax paper lined baking sheet. Refrigerate until cold. Melt the chocolate chips in the microwave or on top of a double boiler. I microwave chocolate chips, stirring every 30 seconds until they are 75% melted. Then I just stir until the rest melt. 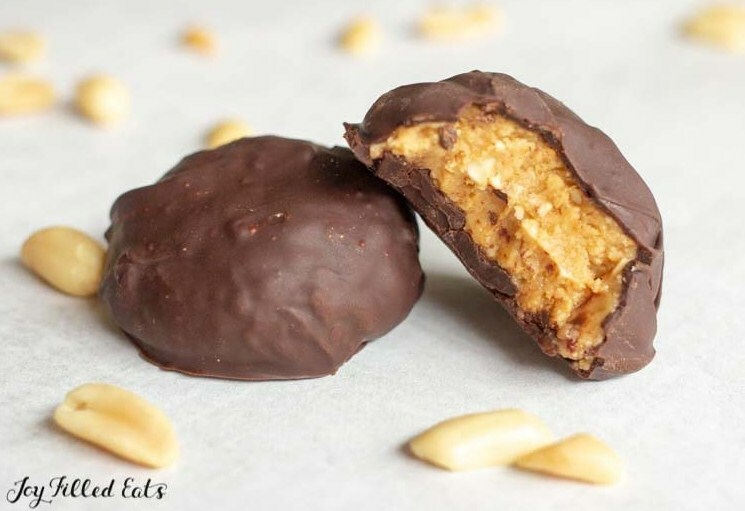 Dip each peanut butter ball in the chocolate and place back on the wax paper. Refrigerate until the chocolate sets.